Home » CONSUMER'S SURPLUS » Diagrammatic Representation. 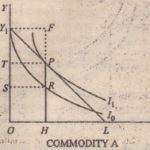 Along OX are measured the units of the commodity to be purchased, and along YO is measured the utility in tens of money, which means the price that the consumer is willing to pay rather than go without a particular unit of the commodity. If the market price is PM, the consumer will extend his purchase up to the Meth unit, i.e., he will purchase OM quantity. This is because Worthies amount his marginal utility is equal to the price. 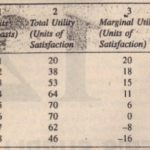 But the marginal utility for the earlier units is more than PM. For M’ the unit, for instance, the marginal utility is P’ M’ but he only pays the market price PM (=P” M) for this unit as for others. He thus obtains an excess of utility for the M’ the unit equal .This is consumer’s surplus from this unit. Similar surplus. arises from the purchase of other units. 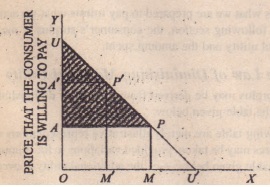 The total consumer’s surplus thus derived by him, when OM units are purchased at PM price, is shown by the shaded area SAP. If the market price rises to P’ M’, he will purchase only OM’ quantity, aim the consumer’s surplus will fall to the smaller triangle. Tile consumer’s surplus arises from the fact that some purchasers arc marginal while others arc 0th.The intro-marginal purchasers enjoy a surplus. Similarly, a consumer enjoys a surplus on infra-marginal purchases, i.e., purchases which are nut marginal.